The Division Lobby was founded to explore the rich and varied improvisation techniques developed by the finest musicians working in the courts, churches, and noble houses of 17th-century Italy. The brainchild of lutenist Paula Chateauneuf, this ensemble brings the exhilaration of spontaneous music creation to the concert platform, transforming 17th-century musical sketches into dazzling virtuosic performances using harpsichords, lutes, violins, lira da braccio, cornetti, and a singer. 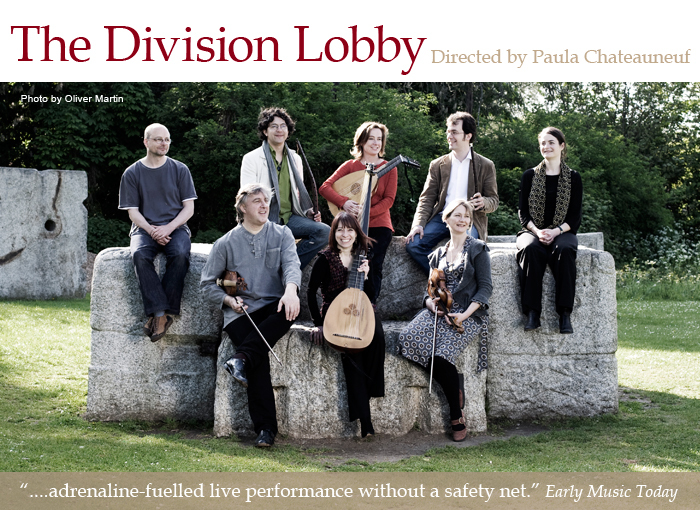 The Division Lobby’s debut concerts have been met with enthusiastic critical acclaim and BBC Radio 3′s Early Music Show devoted an entire programme to the group, its provocative manifesto, and imaginative programming. Copyright, The Division Lobby 2010. Site by Marina Vidor.